The open designs at Trilogy at Tehaleh permit leisurely living, with no walls between the dining and great rooms. A cooking demonstration will take place at one of the model homes at Trilogy at Tehaleh on Sept. 22 from noon to 1 p.m.
BONNEY LAKE — Trilogy at Tehaleh, a resort neighborhood for ages 55 and older, will host a cooking demonstration at one of its model homes on Sept. 22 from noon to 1 p.m.
A professional chef from The Mantel Restaurant at Trilogy at Tehaleh will show attendees how to prepare pulled-pork street tacos while sharing cooking techniques that can be used at home. Visitors are asked to reserve their spot at the demo. Trilogy at Tehaleh is located within the master-planned Tehaleh community. While visiting Trilogy, prospective homebuyers can also participate in a variety of activities at Tehaleh’s Harvest Day festival, taking place from 10 a.m. to 3 p.m. the same day. Trilogy at Tehaleh’s nine single-story floor plans range in size from 1,507 to 2,462 square feet and include two or three bedrooms. Each home features a chef-inspired kitchen, a master suite and a great room, and many include covered patios, dens, and multifunctional SmartSpaces with extra cabinetry and counterspace. For those who are ready to make a move soon, Trilogy offers quick-move-in homes, including the Messina, Trilogy’s Featured Home of the Month. Located on homesite 3187, the 2,327-square-foot Messina has two bedrooms, 2.5 bathrooms and a two-car garage. It features an open kitchen with quartz countertops, a mosaic tile backsplash, and cabinets with crown molding. A sliding glass door in the great room opens to a covered patio. The master suite’s spa-like bathroom has quartz countertops and a soaking tub. A private guest en suite at the front of the home is ideal for visiting friends or family and includes a full bathroom. 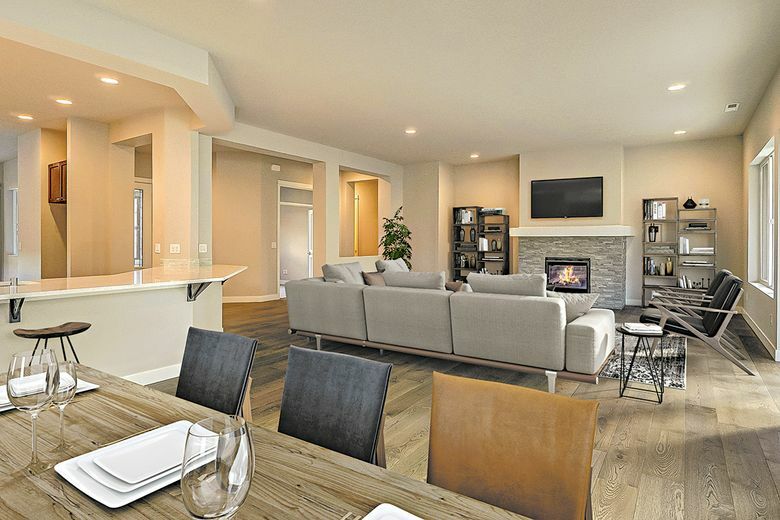 Trilogy homebuyers will have access to the 14,000-square-foot Seven Summits Lodge. It includes the Hawk’s Nest and its flatscreen TVs, full-scale golf simulator, billiards and darts, as well as Four Suits, a game space for anything from poker to pinochle. For foodies, there’s Hudson’s Culinary Expedition, a private space for parties, cooking demonstrations, viewing parties and classes. Fitness facilities at the lodge include the Base Camp Athletic Club, the Flow Body & Mind cardio and mobility studio (which doubles as an artisan studio) and the Two Tides lap pool.